A piece of original art by Robert Crumb has been sold at a record price for a piece of American comic art by Heritage Auctions. 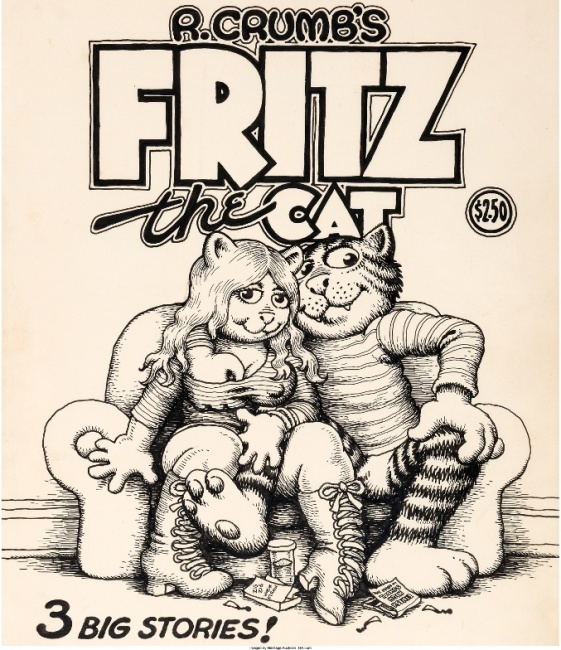 Crumb’s cover art for the Ballantine Fritz the Cat collection from 1969 sold for $717,000. That narrowly tops the old top price for a piece of American comic art, $657,250 for the final page of Incredible Hulk #180, the first appearance of Wolverine, by Herb Trimpe and Jack Abel (see “Comic Art Page Sells for $657,250”). A Frank Miller page sold for nearly $450,000 in 2011 (see “Miller Page Goes for $448,125”). The record price for a piece of comic art anywhere in the world is still over $3.5 million for the flyleaves/end pages for the Adventures of Tintin albums, by Herge (see “Comic Art Sells for $3.5 Million”). Two other pieces of Tintin art have sold for over $1 million (see “Original Comic Art for Over $1 Million”). The art is 11” x 12.5” and was from the Felix Dennis Estate. Fritz the Cat was one of Crumb’s earliest characters, and the subject of two animated features in the early 70s. It's a sign of how much the world has changed that this piece of comic art, a cover for a collection of underground comics that were on the fringe of pop culture at the time, is now the most prized piece of American comic art ever sold.